With over 30 years’ experience of product innovation and process plant design programmes, Dove Thermal delivers effective and efficient conversion of feedstocks & work in progress, and the handling & storage of finished goods. We believe that an efficient plant design should be elegant in the simplicity of its behaviour and construction. They are all prerequisites for the satisfactory undertaking of a production stage or manufacturing process, expressed in terms of quality, throughput and operational economy. 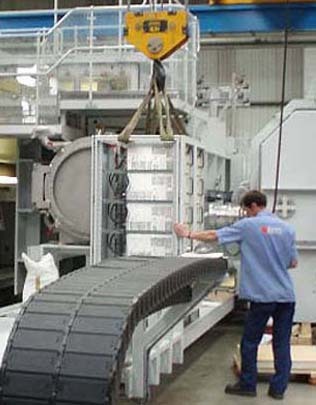 The top photograph shows the trial erection of a pair of polymer deposition plants at a Manchester assembly facility. After pressure and temperature testing followed by process validation, the assemblies were stripped-down then shipped to Luxembourg - where they were installed and commissioned for DuPont Switzerland. For that project, we integrated our process plant design and construction activities with resident teams from the United States, Europe and the UK. Our thermal process plant design consult construct capabilites supplement client resources to assure successful completion of stand-alone or integrated corporate developments. The photographs above show a 10MW boilerhouse and site services facility under construction and in operation, while an autoclave installation serving the DuPont plant is illustrated below. See our Gallery Page for more results of Dove Thermal process plant design and teamwork. Our design-consult-construct activities span environmental, chemical and mechanical frameworks, ensuring innovation and support across the whole breadth of a project's make-up. On-site, hands-on management support ensures accurate placement of project-critical resources. We can resource your personnel & materials needs within a structure in-line with your way of working: moving-along lagging programmes, and undertaking all necessary on- and off-site operations through to commissioning and hand-over.We designed and installed a cooling facility (shown below) at GEC Whetstone to support testing of Olympus engine conversions for gas pumping applications. Dove Thermal Engineering has a strong background in the design of products, plant, processes and equipment, for which many had no paradigm, and were originated from first principles either against a Needs Assessment or compiled Terms of Reference. We design and build process-specific plant and machinery meeting the “Consistent High Standards of Project Management and Design Capability” for which we received an award as the DTI’s long-term technical designers of thermally-related products, systems and plant design. Determining the character and parameters of a given application might represent a greater part of the thermal plant design process than other fields of science and engineering. Taken with its nested discipline of fluid mechanics, Thermal process design has witnessed profound changes in mathematical, physical and engineering methodologies during the past 50 years. It now has the facility to be more precise and flexible; whether this aids comprehension depends upon how thoroughly contemporary tools and their use is understood. With over 30 years’ experience of product innovation and process plant engineering, we are concerned with effective and efficient feedstock conversion, and with the handling and storage of finished goods. We believe that the best process designs have least need for automated control devices, and should be elegant in their construction and behaviour. All our plant construction projects are delivered within budget, on time, and to specification. Examples include mineral colours milling and blending, calender heating and thermo-bonding, vapour phase HTF calorification, and vacuum processing. Dove Thermal designs and builds heat & mass transfer equipment for many types of operation, such as syngas quenching, biomass reactors, cryogenic food processing and autoclaving systems. Design-Consult-Construct projects for Northern Foods et al.